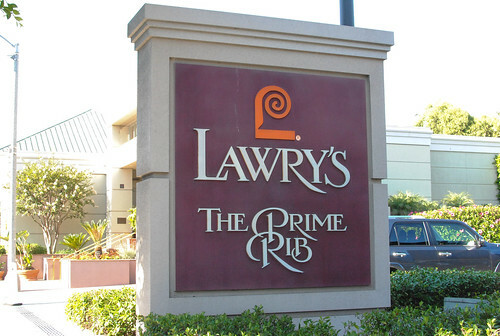 Lawry’s an institution in L.A., nestled in the middle of La Cienega’s ‘restaurant row’ since 1938. That location was the first of many for the chain, which now has restaurants internationally. 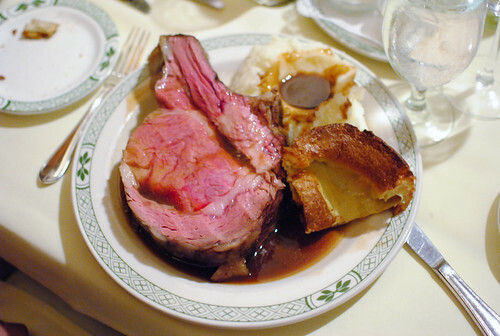 Growing up in San Francisco, I visited the House of Prime Rib a number of times and always heard comparisons when I moved to Los Angeles. I first came while in college with my dad and found the restaurant eerily similar to my S.F. comparison. For what it’s worth, Lawry’s opened first. 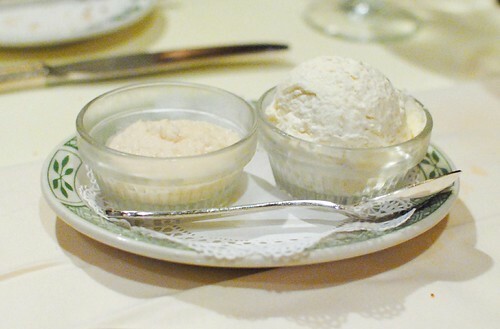 The food at Lawry’s is not complicated or fussy. Sure there are some fish and other meat options, but most people opt for a slice of prime rib (sizing varies from a petite boneless cut to an almost obscene bone-in chunk of meat), served with horseradish, Yorkshire pudding, and mashed potatoes. 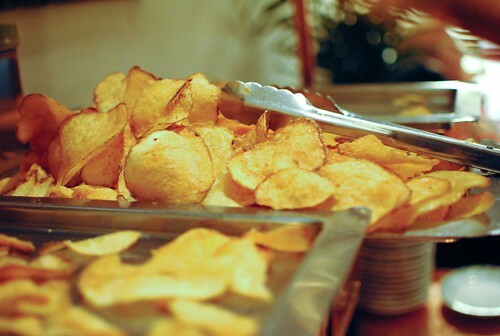 Sides such as creamed spinach, creamed corn, sauteed mushrooms, baked potatoes, and asparagus are extra. 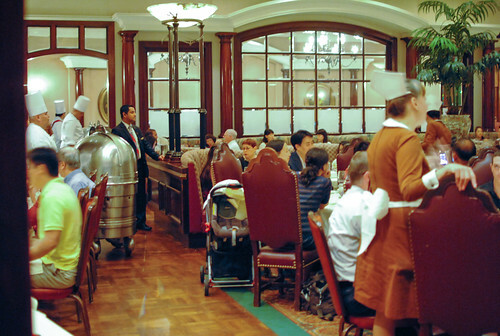 One of my favorite parts about Lawry’s is waiting for a table (imagine that!). 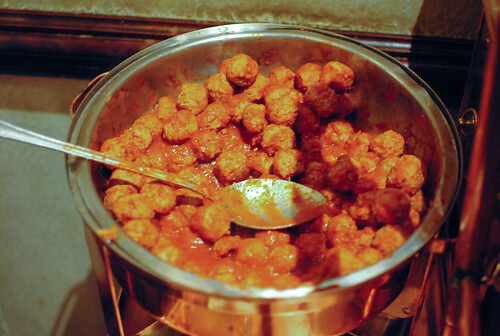 In the waiting room are meatballs in a marinara sauce and house-fried potato chips. I must say they’re pretty tasty and it’s always a struggle not to eat too much. I always end up with a couple of small plates, though. 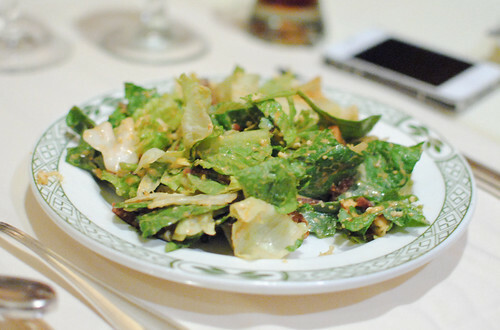 A large salad bowl is put on ice and literally spun, as dressing is poured into the bowl from high above. 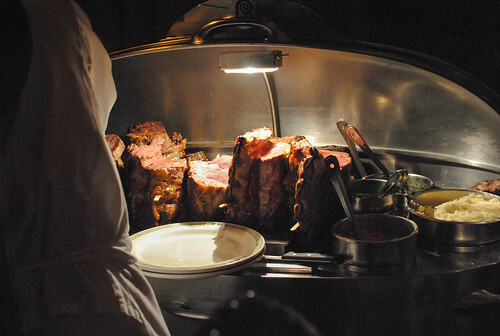 When it’s time for the main course, large silver carts are wheeled around filled with racks of prime rib. Yes, please. 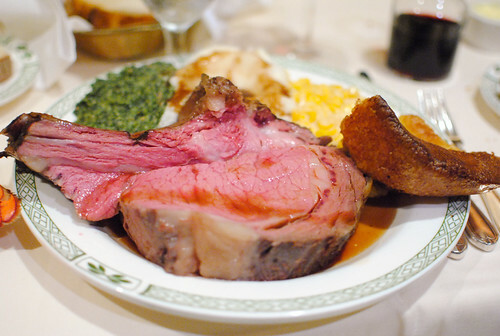 Five ‘sizes’ of prime rib are available ($35-$53); below are the three largest. A large slab of beef is put on each plate, topped with au jus, and served with the sides of choice. It’s quite a sight, for sure. I think the cooking temperatures were pretty spot-on and consistent (easier to do with prime rib than steaks), and I found the prime rib to be tender and juicy. There was a good beefy flavor and I particularly liked their au jus (ask for extra on the side). Total comfort food for me, particularly with the creamy mashed potatoes and gravy. 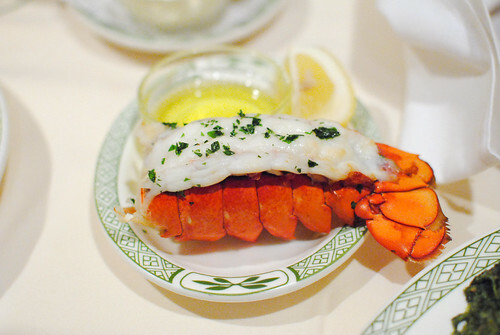 Lobster tails were available to add to the meal – $16 for one and $24 for two. While I thought the lobster tails were reasonably priced, I didn’t think they were anything special. You get what you pay for, I suppose. Save the money and upgrade for a larger cut of beef. 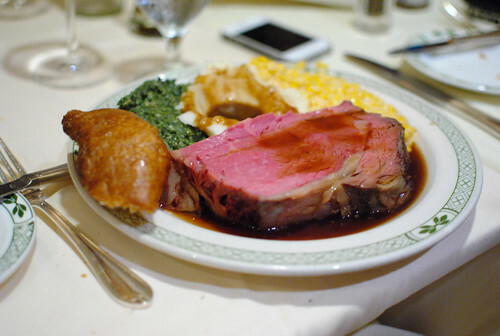 Similar to previous visits, I left my meal at Lawry’s content and full. Prime rib and mashed potatoes happen to be two of my favorite foods, so it’s hard to go wrong. However, prime rib is a relatively easy thing to make at home and I wouldn’t say the beef here is that much better than what a typical home cook can do. But hey, it’s still pretty delicious, good for large groups and has a sense of timeless nostalgia; for that, I’ll be returning here for many years. I am bummed to have missed this meaty FEAST! I doubt I could’ve handled even the smallest cut though. Perhaps it was for the best. Aw, the smallest is pretty manageable; I don’t think anyone got it, but most managed to finish their piece.